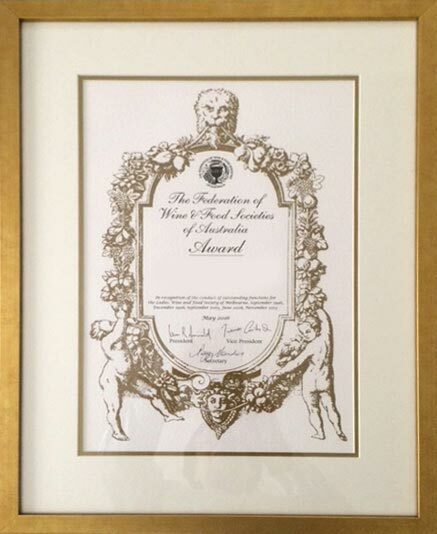 Federation Award | Federation of Wine and Food Societies of Australia Inc. Following nomination and on the recommendation of the FWFSA Executive the Federation Award is made to individuals/organisations who have given prolonged service to the FWFSA or member societies. Individuals must have contributed to furthering the aims of the FWFSA. The award can also be presented to restaurants, hotels, etc. that have given excellent service over a period of time, to the FWFSA or a member society. It may also be awarded for an individual function, such as a banquet connected to a Federation Weekend or Victor Gibson Weekend. In recognition of outstanding service to the Wine & Food Society of Victoria as a talented chef at his restaurant, The Estelle. FWFSA Award nominated by WFS of Hobart – In recognition of her long and dedicated service to the Hobart Wine and Food Society over many years, including as Secretary and as the first female President. 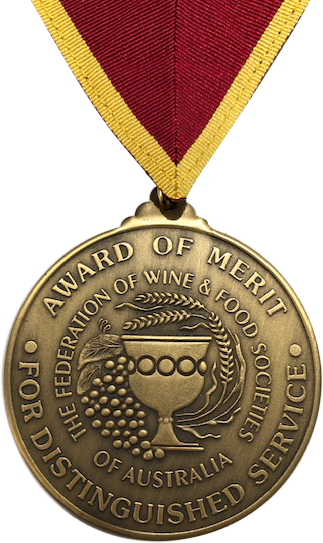 FWFSA Award nominated by WFS of NSW – In recognition of forty year’s dedication to the Wine and Food Society of NSW objectives in the promotion of wine, food and good fellowship, and service on Committee including as President. In recognitions of her outstanding service to the Federation as it’s Archivist over the last decade. For outstanding service to The Federation as its cellarmaster and for his role in helping to organize the 2006 Melbourne Federation weekend. For outstanding service to the Federation in her role in helping to organize the 2006 Melbourne Federation weekend. For ongoing and distinguished service to WFS New South Wales.